One ought to look much what is helpful to him,in order to admit it, and what does him harm, in order to discard it. In every good election, as far as depends on us, the eye of our intention ought to be simple, only looking at what we are created for, namely, the praise of God our Lord and the salvation of our soul. It belongs to God our Lord to give consolation to the soul without preceding cause, for it is the property of the Creator to enter, go out and cause movements in the soul, bringing it all into love of His Divine Majesty. The second, love consists in interchange between the two parties; that is to say in the lover’s giving and communicating to the beloved what he has or out of what he has or can; and so, on the contrary, the beloved to the lover. So that if the one has knowledge, he give to the one who has it not. The same of honors, of riches; and so the one to the other. The First Point is, to bring to memory the benefits received, of Creation, Redemption and particular gifts, pondering with much feeling how much God our Lord has done for me, and how much He has given me of what He has, and then the same Lord desires to give me Himself as much as He can, according to His Divine ordination. 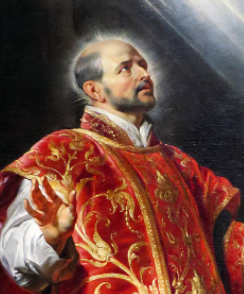 Ignatius of Loyola was a prominent Spanish Christian priest and theologian. He is best known for founding the religious order called the Society of Jesus, or more commonly as the Jesuits.